Eight years after the unsolved real-life killing of a preteen beauty queen from Boulder, Colorado, psychologist Alan Gregory (Blinded, 2003, etc.) 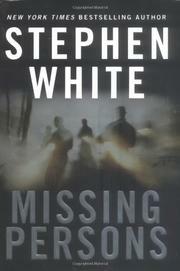 has to deal with the disappearance of one of her classmates. Mallory Miller, 14, vanishes on Christmas Day without any indication of foul play or any footprints in the snow surrounding her family’s house. It’s just a week after the death of Hannah Grant, the therapist Mallory took it upon herself to consult after her parents split up over a psychosis that drove her mother to attend weddings she hadn’t been invited to. What was Hannah doing in her psychiatrist neighbor Mary Black’s office? Why had she left her purse in the middle of her own office floor? And why was her blouse pulled up to bare her midriff and tucked neatly into her bra? These are hard questions, and White provides plenty of time to mull them during a remarkably slow opening movement. Alan is devastated by his discovery of Hannah’s corpse and even more disturbed by a series of hints from Bob Brandt, a long-term schizoid patient, that he knows something about Mallory’s fate. Strapped as usual by the need to keep his patients’ confidences, Alan needs all the help he can get. But his friend Diane Estevez, a social worker who goes searching for Mallory’s delusion mother in wedding-rich Las Vegas, disappears. So does Bob Brandt, driving off in his vintage Camaro after leaving behind a long typescript he asks Alan not to read. With the exasperated help of Detective Sam Purdy and Diane’s determined husband Raoul, Alan will eventually get to the bottom of all those disappearances. Be warned: The solution is just as complicated as the multiple riddles. A fictional echo of JonBenet Ramsey (constantly invoked but never named) buried beneath reams of ethical quiddities, criminal cross-purposes, and mind-boggling coincidences.